Adriana Lima has joined the list of celebrities vacationing on European resorts. 35-year-old Brazilian supermodel chose Greek Mykonos. 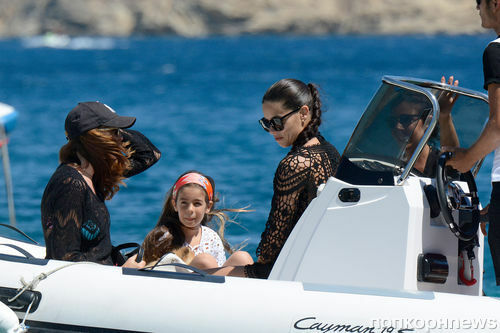 Adriana arrived at the resort with her 6-year-old daughter Valentina and friends. Perhaps the star decided to have a rest before going out on a new stage in her career? Recently Victoria's Secret "angel” has admitted that she wanted to be an actress and to do Tarantino’s films. "My dream is role in Quentin Tarantino’s film - said in an interview Lima. - Fingers crossed for good luck. However, I have not had a chance to tell him about it in person. I'm just waiting for someone to notice me. Hey, I'm here. " 35-year-old Adriana Lima is not afraid of time, pregnancy, or anything else. The figure of the model have long been the envy of the millions of women. Recently, Adriana once again showed that she is in good physical shape. The model rests on the Greek island of Mykonos. For sunbathing Adriana chose candid bikini showing her perfect shape. The secret is to keep an eye on portion size. Food - a source of energy, so it is very important. In interview she also repeatedly told that the sport - an integral part of her life, which allows her to always be on her toes. I do fitness. I lead extremely active life, so my body can endure the intense workout. In addition, I have two children who help me stay in shape, I constantly run around the house! Want some advice? I have a rope and I jump for ten minutes every day. You do not need to starve yourself for hours - ten minutes is enough, - Lima says.